Art Brut recently launched the third salvo of cheeky unrepentant bravado and bluster with the recently released, Art Brut vs. Satan. It may be of interest to some out there that Art Brut are reputable albeit, unofficial, standard bearers of the art movement from which they get their name (according to sometime TSOI contributor, Operative Jbird anyway) …which in one light can be summed up as a form of wholly deliberate sophisticated childishness. The question then becomes, do Art Brut out ‘Art Brut’ more than Bauhaus walk the Bauhaus walk and talk the Bauhaus talk? Give that one a think. Discuss and get back to me next week with your response. I have remarked in the past that there are some bands, for whatever reason, do not make for good subjects to cover. Leonard Cohen and Velvet Underground make for reliable cover fodder, whereas, say Prince and Joy Division make for difficult subjects to cover. The Ramones, I contend, is an example of a band that makes for a difficult one to cover. Every Ramones track is so pure and elemental that trying to reinterpret as a cover would be foolish and probably would not succeed at much other than complicating a good simple tune. I dare say that Art Brut have proved the exception. 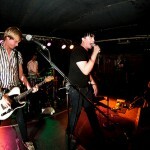 Kudos Art Brut!